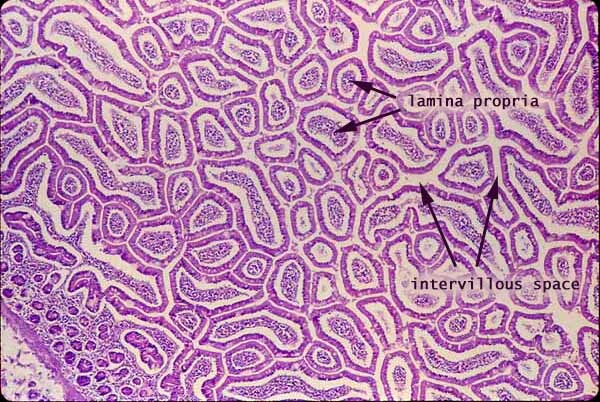 The cross-sectional shapes of villi can be plainly seen when the intestinal mucosa is cut tangentially, as in this image. Some villi have a finger-like shape, while others are more flattened. The length and shape of of villi changes somewhat along the length of the intestine, with villi tending to be flatter in the duodenum and longer and more finger-like in the jejunum. Crypts (small epithelial circles, surrounded by lamina propria) and muscularis mucosa appear at the lower left.